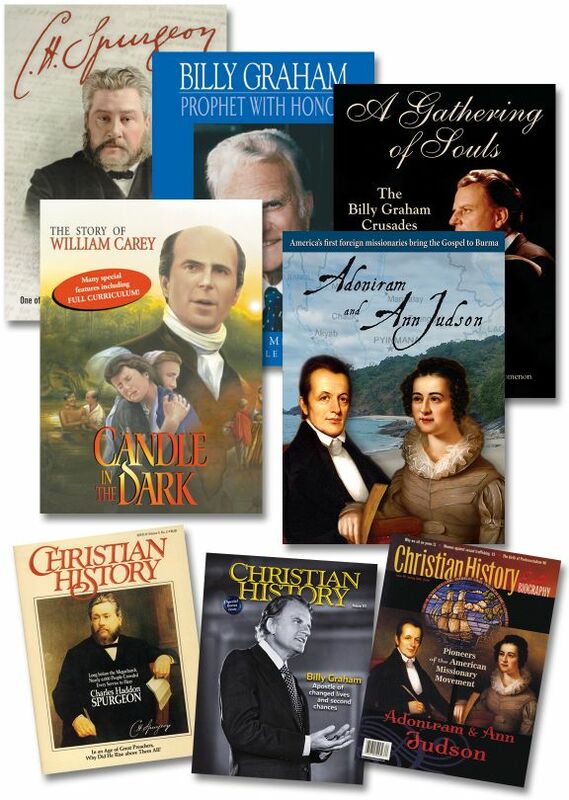 This set of eight, as seen in issue 126 of Christian History magazine, includes five DVDs and three issues of Christian History magazine on influential Baptists. C.H. Spurgeon: The People's Preacher - ﻿Here is the intimate story of one of the greatest preachers in the history of the church. We follow him from his youth where, as a young preacher he is surprisingly called to minister in London and soon captures the love and respect of the nation. He goes on to become one of its most influential figures. This powerful, inspirational docudrama faithfully recreates the times of C.H. Spurgeon and brings the “people’s preacher” to life as it follows his trials and triumphs with historical accuracy. Made by the award-winning Christian Television Association and filmed on location in England, Scotland, France and Germany, this film vividly captures the spirit and message of a man whose eventful — and sometimes controversial — life is highly relevant to the twenty-first century. Billy Graham: Prophet with Honor - In this fast-paced international television special hosted by David Frost, we meet Billy Graham and hear in his own words about his unprecedented opportunities and the formidable challenges that marked major turning points for him. Documentary footage, Dr. Graham’s own explanations, and comments from friends, associates and critics provide insight into one of the most unusual and influential lives of our era. A Gathering of Souls: The Billy Graham Crusades - During his long and distinguished ministry, Billy Graham has preached the gospel to well over 200 million people worldwide. The massive evangelistic gatherings that took place in sports arenas, concert halls, and outdoor venues became known as the Billy Graham Crusades. The outworking of a sophisticated organizational structure, each crusade represented years of planning and months of follow up. The crusades shaped the face of Evangelical Christianity in the 20th century, served as a catalyst for dozens of para-church organizations, united a splintering Evangelical community, and altered the course of countless individual lives. With expert commentary from pastors, academics, Graham associates, and fellow evangelists such as Luis Palau, this documentary gives the history of the crusades from the first event in Los Angeles in 1949 to the groundbreaking 1957 New York City crusade and on to the remarkable gatherings behind the Iron Curtain and in the Far East. Widescreen. Candle in the Dark: The Story of William Carey - William Carey sailed to India in 1793 with a reluctant wife and four children to bring the message of Jesus. There he encountered so much hardship it is amazing he didn't abandon his mission and go home. But he stayed for over 40 years. One issue that tormented him was sati—the burning alive of widows when their husbands died. He would not rest until this practice was stopped. Facing insurmountable odds, he "plodded" on to influence the abolition of sati and to become the revered "Friend of India" and "Father of Modern Missions." He oversaw more translations of the Bible than had been done in all previous Christian history combined. Life was never easy for Carey. But he simply refused to quit, even when a devastating fire destroyed years of his literary work. His legacy has inspired countless others from his own day to the present. William Carey shows dramatically how a life dedicated to God and obedient to His calling can make a profound difference in the world. Starring Richard Attlee, Lynette Edwards and Julie-Kate Olivier. Adoniram and Ann Judson - Adoniram and Ann Judson were American missionaries who sacrificed enormously to bring the gospel to the people of Burma. As the first missionaries sent abroad from the United States, Adoniram and Ann served in Burma (present day Myanmar) for decades. Suffering resistance, persecution, imprisonment, personal loss, and ill health, Adoniram and Ann’s faithfulness led to the establishment of a church that continues to flourish in the 21st century. Today Myanmar is home to the third largest population of Baptist Christians worldwide. The Judsons’ Burmese translation of the Bible continues to be used in Myanmar to this day. Experience the struggles and triumphs of these remarkable missionaries in this illuminating documentary.